Home » NEWS » A CHILD WAS DEAD AFTER A TRAGIC PLAY WITH HIS FATHER? MUST READ!!! A CHILD WAS DEAD AFTER A TRAGIC PLAY WITH HIS FATHER? MUST READ!!! It so nice and overwhelming feeling when we are playing with our kids, spending much time with them. seeing their unforgettable smiles relieving our everyday stressed. But sometimes playing with our kids does not end with a happy ending. In Guangzhou, China. A father and son playtime turn into tragic moments. The Father and Son are playing while roaming around the supermarket, the child was facing with his father's back, while the father is holding both hands. 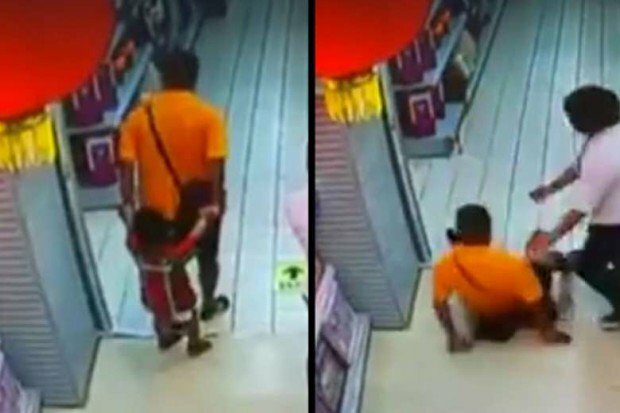 When suddenly the father lost his balance and fell into his son. and as on the video showed the child is motionless. Then a staff had helped them and rushed the child to the hospital but unfortunately, the child was declared dead on arrival. It is so sad because the child could still be alive if it had been treated in a proper way. In the video shown that the good samaritan had lifted the child's body, we do not know if the fracture was on the spine or in other parts. They should wait for the rescue team for a proper care and rescue. This is most people get wrong when rushing the patient to the nearest hospital without the help of the expert or the rescue team which lead to a death of the patient. In the United States, if somebody has moved or lifted the patient's body , even if it is for goodwill , still you will be sued. So if we encounter the same scenario, we must first wait for the rescue of the paramedics, they know well what to do. We also should take care of our children although we do not know when an accident comes, so we must take care always.